HomePoliticsBetsy DeVos Wants to Cut Special Olympics Funding. Here’s Why It Probably Won’t Happen. Education Secretary Betsy DeVos faced scathing criticism this week over a budget proposal that calls for eliminating funding for the Special Olympics, as members of Congress voiced opposition at a hearing that drew widespread attention, stoking a strong defense of the organization across the internet. In its proposal on how to spend that money, the Education Department suggested eliminating 29 programs that have “achieved their original purpose, duplicate other programs, are narrowly focused, or are unable to demonstrate effectiveness,” according to budget documents. Congress has repeatedly rejected efforts to reduce the Education Department’s spending, including in recent years when Republicans controlled both chambers. Last year, when Mr. Trump proposed reducing funding for education, lawmakers instead increased funding for the department. During her exchange with House representatives on Tuesday, Ms. DeVos defended her budget’s overall approach, but faced sharp questions from some representatives, including Mark Pocan, Democrat of Wisconsin, who said that he had two nephews with autism. 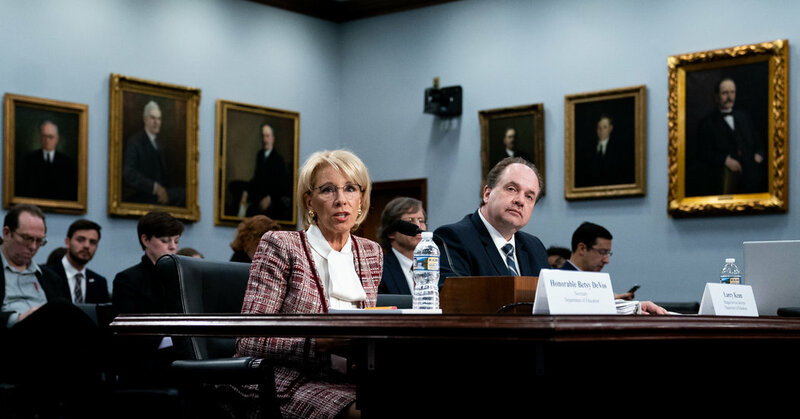 “We had to make some difficult decisions with this budget,” Ms. DeVos replied, acknowledging that she was not sure the exact number of children effected by the proposed funding cuts to the Special Olympics. “Make no mistake: we are focused every day on raising expectations and improving outcomes for infants and toddlers, children and youth with disabilities, and are committed to confronting and addressing anything that stands in the way of their success,” she said. A spokesman for the Special Olympics did not respond to a request for comment.